This post is sponsored in conjunction with #BrunchWeek. I received product samples from sponsor companies to aid in the creation of the #Brunchweek recipes. All opinions stated are my own. Thank you for supporting the brands that make this blog possible! 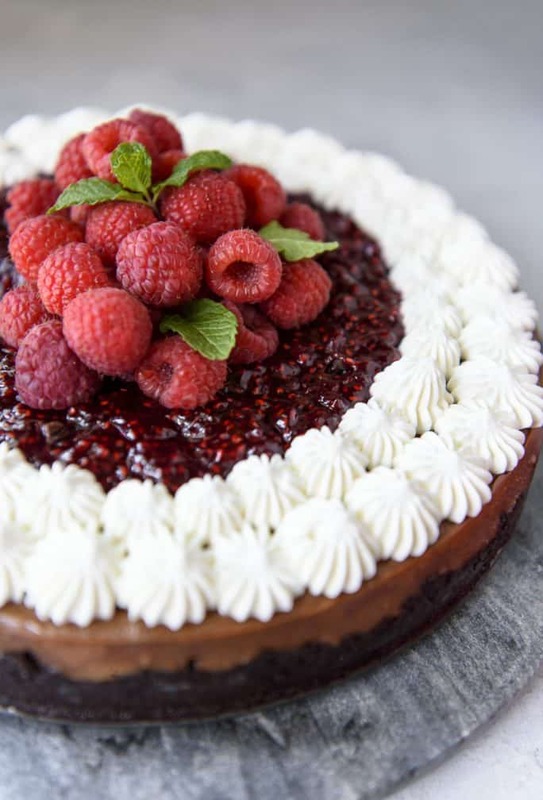 Silky-smooth, rich, and tangy Raspberry Chocolate Cheesecake is the perfect happy ending to any meal – even brunch! 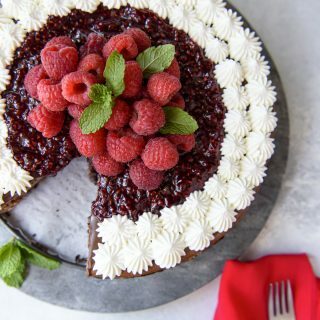 Nestled in a chocolate cookie base, this creamy raspberry-kissed dark chocolate cheesecake is topped with a homemade raspberry jam, whipped cream, and even more fresh raspberries and fresh mint for a beautifully festive look. This is the ultimate dessert for Mother’s Day, Father’s Day, birthdays, or any extra special holiday. Cheesecake is not normally on my horizon when I think brunch. Mainly because I usually stuff myself full of crepes or French toast and have no room left for any sweets. There’s only so much sugar a person can eat in one meal, and that includes me. That didn’t used to be the case back in my high metabolism-fueled 20’s, but we’re not here to talk about those golden years. 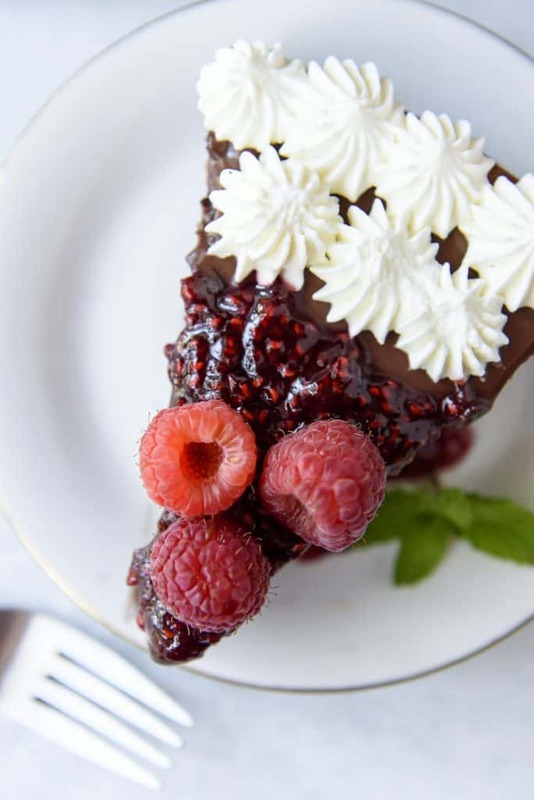 Give me a special occasion, however, and I can make room for something as decadent as this Raspberry Chocolate Cheesecake! Easter, a birthday, in honor of Nana on Mother’s Day. I will skip the scones and even scale back to just one mimosa to leave space for a sliver of this goodness. Raspberry Chocolate Cheesecake…one of the best flavor combos ever! If I’m being real here, I actually don’t like chocolate cheesecake. I mean, I didn’t until this one came along. I’ve always been more of a cheesecake purist. I’ll drizzle, douse, and spoon over any topping on my slice, but it has always been a plain Jane New York-style cake that I preferred. Considering what a chocolate lover I am, this distaste for it in my cheesecake never really made any sense. It’s not just me, is it? Maybe the chocolate versions I’ve had in the past just weren’t made with the right stuff, but it always somehow tasted a bit off to me. Like a cheesecake imposter. Maybe it’s the LorAnn Rasberry Baking Emulsion that did it, but this chocolate cheesecake recipe was somehow right up my alley. And it was a hit with everyone at our annual Easter Nibbles & Sips dinner this year where it debuted, even though there was a little bit left on each plate at the end of the night. It turns out the combination of chocolate cookie crust, dark chocolate-raspberry cheesecake, and homemade raspberry jam was slightly on the rich side. Worth noting when you make it – cut small slices. You can always go back for more later! This cheesecake recipe is also super easy, and there’s no need for a water bath! A water bath, or bain-marie, is usually recommended when baking cheesecake to help evenly disperse the heat during baking. 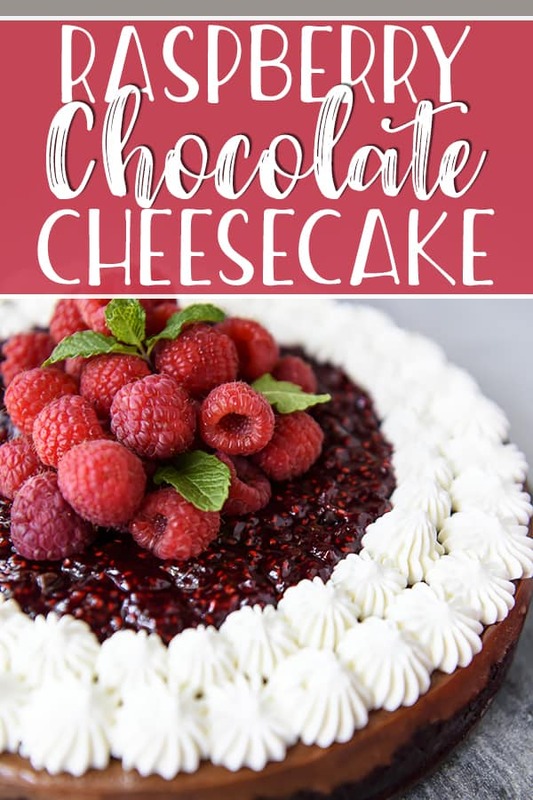 This helps avoid cracks in very dense cakes, but this cheesecake replaces 1/4 of a traditional recipe’s cream cheese with sour cream. This means softer, lighter bites, extra tang, and less of a chance of cracking. It also means slightly shorter baking time and no dealing with boiling water! Tips on how to make a Chocolate Cheesecake perfect every time! Invest in quality chocolate and the freshest raspberries you can find. You can melt chocolate chips and use them for your chocolate base, sure – but a high quality dark chocolate like Ghirardelli, Lindt, or Scharffen Berger will make all the difference in your final product. And frozen raspberries only belong in the jam…unless you can use fresh, in which case – DO. Use room temperature cream cheese and eggs. Cream cheese is at its creamiest at room temperature, meaning it will incorporate into the batter much better. When it’s too cold, the cream cheese will have small lumps that won’t fully blend, resulting in possible over-beating of the batter. In the case of eggs, since cheesecakes have such a high fat content, adding cold eggs could re-harden the fat in the room temp cream cheese – another great recipe for a lumpy disaster. Avoid over-mixing. Mix the batter until everything is just combined, meaning no lumps and no strands of egg yolks. Overbeaten cheesecake batter = cracks, which in the case of this recipe don’t matter. As a general rule, though, following this tip will always get you lovely, creamy cheesecake. For best results, use a greased springform pan. Flipping a cheesecake out of a pan is a bad idea – the presentable part is the top, and inverting it will undoubtedly ruin in. Investing in an 8- or 9-inch springform pan with the removable ring make cheesecakes a breeze. Make sure to always line the bottom of the pan with a round of greased parchment paper so lifting the cake out of the base is equally easy. Make sure it’s cool before removing it from the oven and chilling it fully. After the cheesecake is set, turn off the oven and crack the door open slightly – just enough to slip the handle of a wooden spoon in the hold it open. Warm it up a bit before serving, and I don’t mean in the microwave. Pull the cheesecake out of the refrigerator about 30 minutes before serving it. A slice of very cold cheesecake isn’t nearly as creamy as a slice that’s been thawing and melding flavors. Heat your knife, too. Cheesecake is very dense, but is also very sticky and can get messy when cut into. For a perfect slice of cheesecake, use a very sharp knife that you’ve warmed under a steady stream of very hot water. Dry it quickly, make a slice, and repeat for those Instagram-worthy slices. Love cheesecake? Try one of these other yummy cheesecake recipes next! Don’t forget to enter our enormous #BrunchWeek giveaway – You could win one of SEVEN prize packs, including an Instant Pot from our friends at Dixie Crystals! 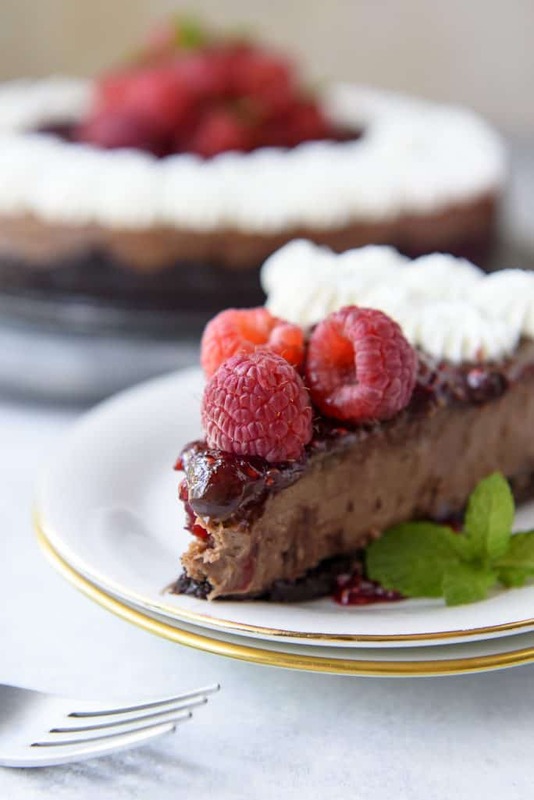 Silky-smooth, rich, and tangy Raspberry Chocolate Cheesecake is the perfect happy ending to any meal - even brunch! 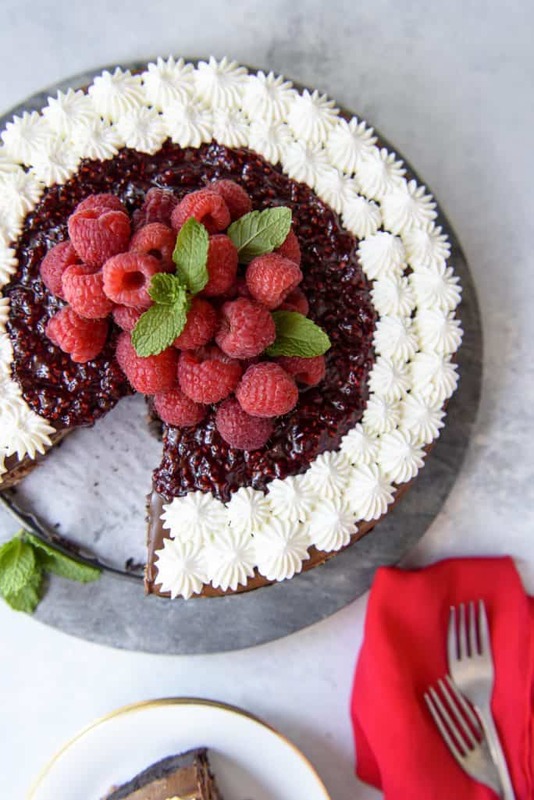 Nestled in a chocolate cookie base, this creamy raspberry-kissed dark chocolate cheesecake is topped with a homemade raspberry jam, whipped cream, and even more fresh raspberries and fresh mint for a beautifully festive look. This is the ultimate dessert for Mother's Day, Father's Day, birthdays, or any extra special holiday. Preheat oven to 325° F. Line the bottom of a 9-inch springform pan with a round piece of parchment, then spray with cooking spray or grease with butter. Blend sandwich cookies in food processor until finely ground, or place in a large zipper bag and crush with a rolling pin. Add melted butter and pulse or stir until well blended. Press crumbs evenly onto bottom and about 1-inch up the sides of the springform pan. Bake just until set, about 5 minutes. Cool while preparing cheesecake filling. Microwave heavy cream in two 30-second intervals, until warmed through. Place the chopped chocolate in a bowl and pour the warm cream over, ensuring it is completely covered. Allow to sit for 3-5 minutes, then stir with a rubber spatula until completely melted and combined. Allow to cool about 5 minutes. In a stand mixer, blend the cream cheese, sugar, cocoa powder, and salt at medium speed until smooth. Blend in eggs 1 at a time, mixing well between each. Slowly blend in lukewarm chocolate, and vanilla and raspberry extracts, mixing until just combined. Pour filling over crust and smooth out the top. Bake until center is just set and just appears dry, about 45-50 minutes. Turn oven off and prop the door open with the handle of a wooden spoon. Cool the cheesecake in the oven for 1 hour, then cover and chill in the refrigerator 4-5 hours or overnight. When ready to serve, remove the cheesecake from the fridge at least 30 minutes beforehand. Run the blade of a knife around the sides of the cheesecake to loosen if necessary, then release from the pan. Transfer cheesecake to a serving plate. Cover the top of the cake with cooled raspberry jam, dollops of whipped cream, and a pile of more fresh raspberries. Garnish with sprigs of mint if desired. Place raspberries and sugar in a large saucepan set over high heat. Bring to a boil, stirring constantly, for 4-5 minutes. Reduce the heat to medium and allow to boil for 20-25 minutes, stirring frequently, until mixture reaches 220˚F on a candy or instant thermometer. Add lemon juice and stir well. Allow to cool to room temperature, then transfer the jam into a bowl, cover, and chill. Ladle any unused jam into a mason jar and keep refrigerated until ready to eat. Cheesecake can be made 3 days ahead; keep covered in the refrigerator until ready to serve. PIN THIS DELICIOUS CHOCOLATE CHEESECAKE RECIPE FOR LATER! With your version of cheesecake, I might skip my main brunch meal and go straight to this. Love the texture and flavor combination you have here.